La Scena Musicale: Austin Symphony Takes Stravinsky's Rite of Spring "Beyond the Score"
Austin Symphony Takes Stravinsky's Rite of Spring "Beyond the Score"
For major orchestras, Stravinsky’s Le sacre du printemps has become standard fare, but for second and third tier orchestras it is still a huge challenge, for both technical and financial reasons: for the players, the rhythms and harmonies are difficult; for managers and boards, the costs for additional players and extra rehearsal time are not easy to swallow. 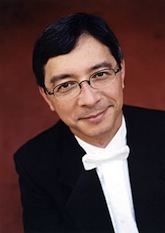 The Austin Symphony is a part-time per service orchestra, which nonetheless manages to play consistently at a very high level under music director Peter Bay (photo: right). They far exceeded even their own standards with this week’s performance of Le sacre du printemps. The evening began with “Beyond the Score,” a multi-media introduction to the score, originally prepared for the Chicago Symphony by Gerard McBurney. After intermission we heard a complete performance of the piece. Several seasons back, Austin heard a “Beyond the Score” presentation of Dvorak’s New World Symphony; it was very well received. The audience seemed to like what they saw and heard on this occasion as well. In both the Dvorak and the Stravinsky presentations, McBurney made extensive use of actors to bring the piece to life. 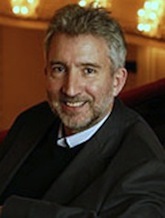 In Le sacre, Rick Rowley – better-known locally as a pianist on the faculty at the University of Texas – played Stravinsky, and Robert Faires, a well-known Austin actor and critic, played Nicholas Roerich, the man who conceived the sets and costumes for the original production of the piece in Paris (1913). McBurney provided narration, as Rowley and Faires discussed the creation of the new ballet. To McBurney’s (photo: right) credit, we in the audience learned a great deal about the use of folk tunes – Russian and Lithuanian – and about Stravinsky’s imitation of Russian folk instruments in Le sacre. We also got a sense of the collaboration between composer and set designer. We never saw what was created, however; that is, costumes, sets, or choreography. 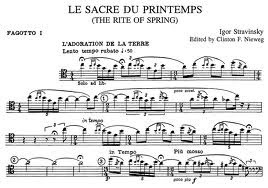 This is odd since McBurney had a giant screen over the orchestra at his disposal and, after all, Le sacre du printemps was conceived as a ballet - not as a concert piece. The “Beyond the Score” series was devised by the Chicago Symphony with McBurney as creative director. The idea was to “open the door to the symphonic repertoire for first-time concertgoers as well as to encourage an active, more fulfilling way of listening for seasoned audiences.” The concept is timely when orchestras everywhere are struggling to hold their aging audiences and attract new listeners. “Beyond the Score” makes use of any media available on the piece presented, including videos, photographs, recorded examples and live dramatizations with actors. McBurney and the Chicago Symphony deserve enormous credit for bringing these projects into being and for sharing them with other orchestras. For Le sacre, McBurney chose to concentrate on the roots of the music. This emphasis is entirely appropriate since Stravinsky’s music for this ballet was truly revolutionary, and we can all understand it better if we analyze its key elements and identify its folk roots. McBurney handled this part of his project with great skill and undoubtedly helped the audience prepare for the complete performance of the piece. Nonetheless, it seems to me that while McBurney made good use of his giant screen to show us musical examples, much more could have been done to give us a sense of the costumes, sets and choreography. McBurney chose to give us dramatizations of conversations between Stravinsky and Roerich (photo: right), but failed to show us any of Roerich’s work, a vital part of the collaboration. The actors read their lines with conviction, but I was puzzled as to why Rowley (Stravinsky) had a heavy Russian accent while Roerich (Faires) did not, when both men were, in fact, Russian. From my vantage point in the first balcony (mezzanine), the images on the giant screen over the orchestra were washed out. On meeting after the concert, some friends sitting in the second balcony section expressed their annoyance at having had only a partial view of the screen; this may have had something to do with the placement of the screen as far as possible upstage, behind the considerably enlarged orchestra. The paucity of visuals and some poor sightlines notwithstanding in the “Beyond the Score” part of the program, the symphonic performance of Le sacre was excellent. Maestro Peter Bay was in total command of the intricate rhythms and inspired the Austin Symphony to give a vivid and dynamic performance. With the orchestra enlarged, the sound emanating from the stage had presence and impact. As required by the score, there were eight French horns, which Maestro Bay placed against the back wall. These projected an enormous sound, especially when in the "Ritual of the Ancients" they were required to play fff with the bells of their instruments in the air (Le pavillon en l’air). In the final section of the piece, scored for constantly changing meters, all the musicians in the orchestra showed enormous concentration and virtuosity. Le sacre du printemps has been reconstructed and staged in our time by Millicent Hodson and Kenneth Archer using some of Nicholas Roerich’s original costume and set designs. You can see it for yourself in a performance by the Mariinsky Orchestra and Ballet conducted by Valery Gergiev (BelAir Classiques DVD BAC041). There is also a fascinating performance of the score by the San Francisco Symphony conducted by Michael Tilson Thomas (MTT) presented on television as part of the orchestra’s “Keeping Score” series; it brilliantly combines performance; commentary on the choreography by MTT, Millicent Hodson and Kenneth Archer; the printed score for viewers to follow; and pictures of Roerich’s sets and costumes. Excerpts are available at www.keepingscore.org. For more on the work of Hodson and Archer visit their website at www.hodsonarcher.com. 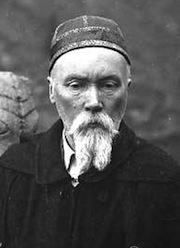 For more on Roerich visit the Nicholas Roerich Museum in New York or the website www.roerich.org. Thank you for taking the time to discuss this, I feel obviously about this and I would like to learn more on this topic.